My good friend is gone. He was an interesting horse to talk to... he had seen the worst and best in humans during his life. He was a padded show walker in his younger years, passed over and passed on eventually to a careless and thoughtless human. Sonney starved to the point his shoes nearly weighed more than the rest of him. Then the good part of his life began with my two favorite aunts (other than my current feeding aunts, of course); through hard work and much love, they brought him back to health and happiness. They had great fun riding trails, gaiting up a storm, and finding the occasional mischief whenever Mother was involved. Sonney was always happiest with his person aboard and a wide level trail to travel. Unfortunately his earlier mistreatment left him with long term effects that progressively reared their ugly heads. He had many struggles with colics, mysterious maladies with his kidneys and circulation, and most recently EPM. 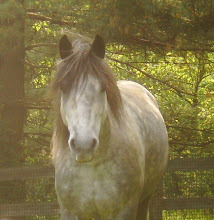 It was with great sadness that, after another bout of colic, his humans let him go. He was so well loved, it is almost impossible to fathom. What a rough life :(, though at least he had a happy period. Our many condolences, Bif. So sorry to hear this news - our deepest condolences at Sonney's passing. His ending days were that of knowing love. Our condeolences to you for loosing a dear friend Boyfriend. Sorry to hear about Sonney. I'm sure he'll find many lovely wide trails to ride in heaven, pain-free.